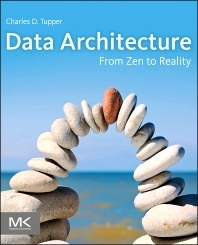 Data Architecture: From Zen to Reality explains the principles underlying data architecture, how data evolves with organizations, and the challenges organizations face in structuring and managing their data. Using a holistic approach to the field of data architecture, the book describes proven methods and technologies to solve the complex issues dealing with data. It covers the various applied areas of data, including data modelling and data model management, data quality, data governance, enterprise information management, database design, data warehousing, and warehouse design. This text is a core resource for anyone customizing or aligning data management systems, taking the Zen-like idea of data architecture to an attainable reality. The book presents fundamental concepts of enterprise architecture with definitions and real-world applications and scenarios. It teaches data managers and planners about the challenges of building a data architecture roadmap, structuring the right team, and building a long term set of solutions. It includes the detail needed to illustrate how the fundamental principles are used in current business practice. The book is divided into five sections, one of which addresses the software-application development process, defining tools, techniques, and methods that ensure repeatable results. Data Architecture is intended for people in business management involved with corporate data issues and information technology decisions, ranging from data architects to IT consultants, IT auditors, and data administrators. It is also an ideal reference tool for those in a higher-level education process involved in data or information technology management. Why Do We Need Development Methodologies? What Are the Basic Functions in an Organization? Why Invest in Information Technology? What Are Models and How Did They Come About? What Does Modeling Do for Us? How Are Automated Models Developed? What Is to Be Done with Historical Data? Why Can’t OLTP Data Stores Be Used? Where Is the Relational Data Warehouse Best Suited? Where Is the Dimensional Best Suited? Why Would You Want an Enterprise Data Warehouse? What Are the Important EDW Driving Forces? I am extremely thrilled that Mr. Tupper has decided to write this book. This book would fill a void in knowledge and know-how in the area of data administration and architecture. Mr. Tupper built over the years an impressive expertise and authority on the subject of enterprise data architecture. I see a wealth of information ranging from technical reference information to higher level concepts and principles. Overall a very comprehensive guide where some sections can be read in a flowing manner to enhance understanding of the topic and other sections can be flipped to/from to provide greater detail and context.